Welcome to SXSW. The best music festival on the planet. Four days of total musical immersion. Bloggers’ paradise. Most bands barely known and yet to be discovered by the mainstream. Within a few shows that could all change for some of the lucky ones. That's the thrill, which is it gonna be? For every band you see, you'll be missing another 50. So you gotta bring your runnin’ game. First venue and the sound is all over the place (this is a theme). Band struggle manfully on but it’s no good. The moment’s gone, and so am I. Next one up is running late. I can only stay for one song. It’s enough. Something good going on there. I'll investigate it more when I get home. I run on to catch Naked And Famous playing to a word-of-mouth packed first show (of 8 over the 4 days). The sound is a battle but they win out and SMASH it. First bout to TN+F, a knockout. Back east for four other bands. One's cancelled, the next is dreampop, that seems to be another theme already this year. Good music but not right for us. Then on to some hip hop, and a bedroom lap topper. Before I know it, its 2am and the travel and five-hour time difference are taking their toll so I leave it at that. Tomorrow is another (hot) day. Today is all about lines. And not the ones you're imagining. I'm talking about queues and lots of ‘em! Great big long ones to get into anywhere. Frustrating for a poor A&R man trying to run between shows. See the problem with SXSW being the best festival on the planet is someone's gone and told everyone. It's heaving! I hear later on that registration for the interactive part of SXSW has gone up 30 percent. Sign of the times. All the day parties are branded, free and rammed! Queues snake around blocks, and it’s roasting hot. Not the right day for me to wear all black. To get to see all the bands in time, the only answer is the trusty peddle taxi. Whizzin in and out of the walkers from A to B in (nearly) no time. I manage to catch a fair bit of who I want to see. One memorable excursion takes me into the leafy suburbs surrounding Austin. Eventually winding up watching a band on someone's back porch. Accompanied only by the proverbial two men and their dog. Very good they are too. Another finds me stumbling across grunge legend J Mascis playing a charming acoustic set in a fetching purple baseball cap. Gotta be honest though despite a few other interesting artistes, including one boldly trying out an a capella version for the first time while being buzzed by a corporate sponsored plane; and another accenting their performance through the medium of dance (a Hari Krishna by the looks of it), nothing much from today's crop really leaps out at me. Higher hopes for tomorrow. Another scorcher! More suitably dressed today though. Starting to get "walker's foot" from pounding the asphalt. Most people seem to have the odd blister or two by now. Still, we all schlep on. Started the day at the "BMI Brunch" at Four Seasons hotel. An intense hyper-network and free food fest. It's a bit of a head spinner this early after a very late one the night before. Packed out with industry types peering over each others’ shoulders to spot anyone more important. A few artists play gamely, battling to be heard above the power micro meetings. The food runs out and everyone drifts away to start checking out bands (or go back to bed). Over to Fader Fort, a 1,000-capacity construction over the highway. I catch a couple bands and some free candy floss, then back to the main drag for a couple more, bumping into plenty of Brits on the way. All enjoying the fest and the weather but none feeling they've seen "the one" yet. On to see Naked And Famous at Emo's but the queue is too long - a good thing - so I skip it and head to a label meeting at the convention centre. Back to Fader Fort to catch Odd Future, already signed but I wanna see if they live up to the hype. The line is ridiculous so I head off to get some tucker in a handy half hour before the evening's bands kick off. Stubbs is first stop. The largest outdoor stage. First band on is hotly tipped so I'm happy to queue for an hour to make sure I get in. They're worth the wait. That's pretty much the evening's high point for the next few hours. A lot of the other bands seem to be on autopilot, trying really hard to impress and "put on a show", but forgetting the emotional connection with their music. I manage a quick stop in at TV On The Radio before I’m off to Naked And Famous, the final band to play. They kill it for their fourth show in three days. It's an intense one and Thom finds an extra gear halfway through the set which sends the audience mental by the end. Up to Waterloo Records. One of the best indie record shops I've been in. A great selection of music, authentic feel, the right mix of music, books/DVDs, merch, and awesome staff. I stock up on loads of CDs of the indie/unsigned stuff to digest back in UK. Bands are playing in the parking lot. Jack White is around somewhere. We need one of these for the Fiction office! Driskill Hotel for breakfast and lawyer meeting. Over to Fader Fort for three bands. 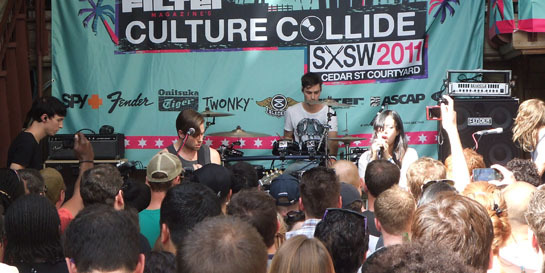 Back to Cedar Street courtyard for final Naked And Famous show. Band exhausted but go down a storm none the less. They're off to Germany for some shows next, then back to USA for a support tour. Back to Waterloo for management meeting and I catch J Mascis again. Shredding like a monster. Into a branded party for free vodka and a mediocre rock band the on to Iron Works for great Bar B Q food. Free beer? Oh go on then. Into to a church hall for some Scandinavian shoegaze. Followed by trek over east to finally catch Odd Future. They blow it up! Back to sixth for epic Aussie poprock, and then a pedal taxi out west for wild card band which disappoints. A final trek east for a great Sixties-style psych beat combo, and I'm done. Back to hotel for two hours sleep then leave for the airport for 10-hour flight home. Austin thank you and goodnight.